There are spoilers about the first book below. If you haven't read it, beware. Um, also, if you haven't read it, WHY NOT? Julie's wish in the well might have restored her life to normal, but it hadn't turned back the clock or erased any consequences. The aftereffects of the Wild continued to linger. Glass slippers, poisoned apples, and spinning wheels littered the town. Gingerbread houses moldered in the open air. Spells and enchantments continued to cause otherwise ordinary people to catch flies with their tongues or dance until midnight. At the end of her adventure in the Wild, Julie had to make a choice: stay there with her father, or vanquish the Wild. She chose the latter, and she fully expected to never seen him again. But then, one day, for no reason that anyone can figure out, the Wild spits out Julie's father, and Rapunzel is suddenly reunited with her Prince. You'd think that would be a happily-ever-after, but no. Julie's father reappears in Chapter One. Shortly thereafter, Rapunzel and her mother are turned into pumpkins by Bobbi, Cinderella's fairy godmother, who then kidnaps the (still sleeping) Sleeping Beauty and takes off -- with Julie's father (and Julie!) in hot pursuit. This one made me think about a couple of fairy tales in ways I'd never really thought about -- Red Riding Hood is a really gross story and there's a whole rebirth angle that had never occurred to me before (Am I dumb? ), and Rumpelstiltskin is a much more tragic figure here than in A Curse Dark As Gold, let alone the original story. It makes me happy that these old stories inspire so many different interpretations and re-tellings and re-imaginings. I loved Into the Wild a whole lot, but you know what? 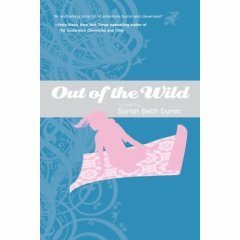 Out of the Wild was even better. I was so happy that the events of the first book changed the world, that there wasn't some sort of time-blip and everyone forgot what they'd been through. That, in itself, made the Wild much scarier and made the story more real. I suspect this duo will turn a whole lot of kids on to old fairy tales, urban fantasy and the power of story in general. CC and Lauren, this is for you.